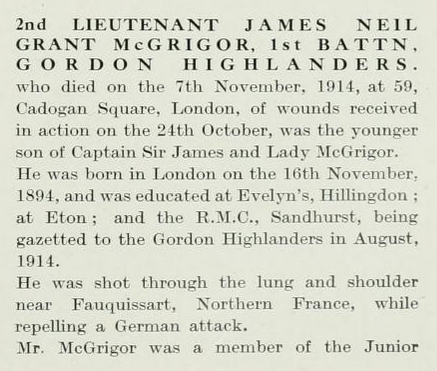 James ‘Neil’ Grant McGrigor was born on 16 November 1894, the second of four children born to a wealthy banker, Captain Sir James Rhoderic Duff McGrigor, and his American wife, Lady Helen. 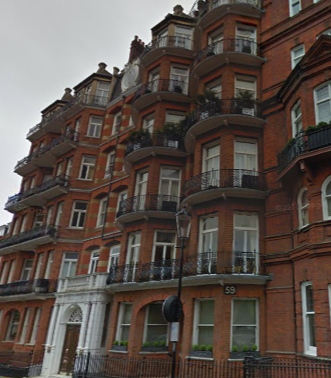 The couple had married in 1890 and lived at 29 Sloane Gardens, Chelsea London. They also had a home in Datchet, at Rosenau, a 30-room riverside property in Southlea Road, (on the site now occupied by Woolacombe). 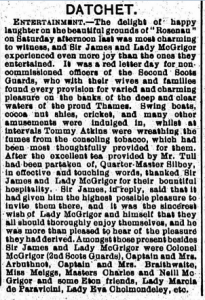 They were there on the night of the 1911 census with a butler, footman, cook, kitchen maid, domestic nurse and two housemaids. Lady Helen, born Helen Cornell Meiggs, was an American from Brooklyn, New York. She was the daughter of John Gilbert Meiggs, a railway contractor. He and his brother Henry built the Oraya Railroad in Peru and he also built several important railroads in Argentina. Sir James came from a military family. 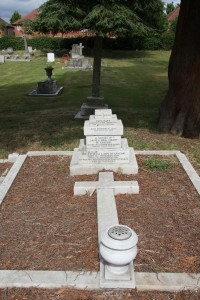 His grandfather was Sir James McGrigor, Bart, KCB, MD, a military surgeon and, for 36 years, director-general of the Royal Army Medical Department. The McGrigor baronetcy, of Campden Hill, Middlesex, was created for him in 1831. 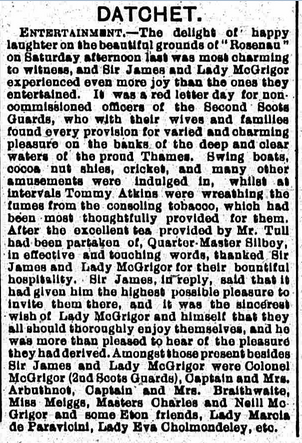 Sir James’s father was Sir Charles Rhoderic McGrigor, 2nd Baronet, born 1811. He was educated at Eton and married Elizabeth Anne Nickle, the daughter of another military man, Major General Sir R Nickle K.H. 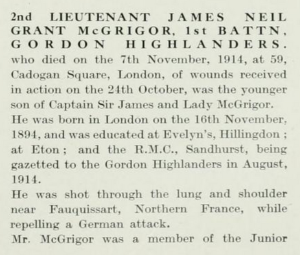 So, it was perhaps no surprise that Sir James’s sons, Charles Colquhoun McGrigor, born 1893, and James Neil Grant McGrigor joined the military. 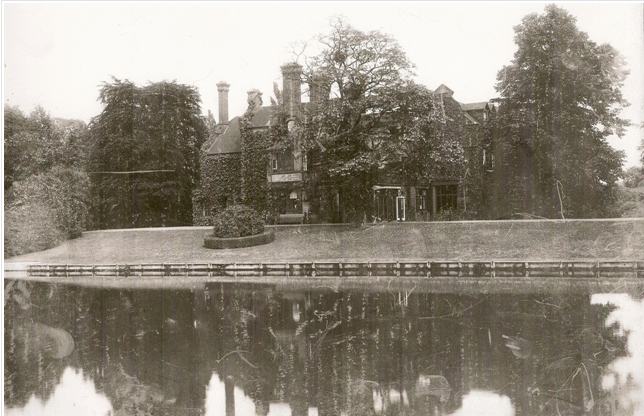 ‘Neil’ (as James was often known, to differentiate him from his father) was educated at Evelyn’s, Hillingdon; then Eton (where he won the Junior Sculling race in 1912). He also went to Sandhurst and was gazetted to the Gordon Highlanders in August, 1914. Charles and Neil had two sisters. Jean Helen was born in 1902 in Hillingdon (Sir James was on the electoral register at Parkfield, Hillingdon, that year). Dona Mary was born in 1908 in Chelsea. Dona died as a baby in a tragic accident. 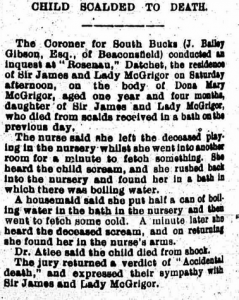 She was scalded in a bath tub in 1909 when her nurse left her alone in the nursery. 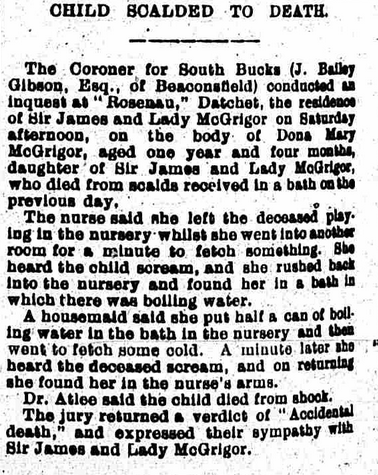 Her death was reported in the Slough, Eton & Windsor Observer, on 3 July 1909, above right. 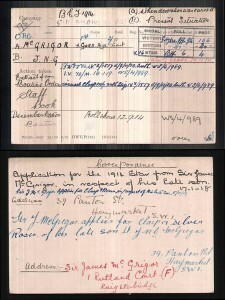 Neil was gazetted to the Gordon Highlanders in August 1914 as a 2nd Lieutenant in the 1st Battalion. The regular force battalions (1st and 2nd Gordons) had been immediately assigned to the British Expeditionary Force on the outbreak of war. 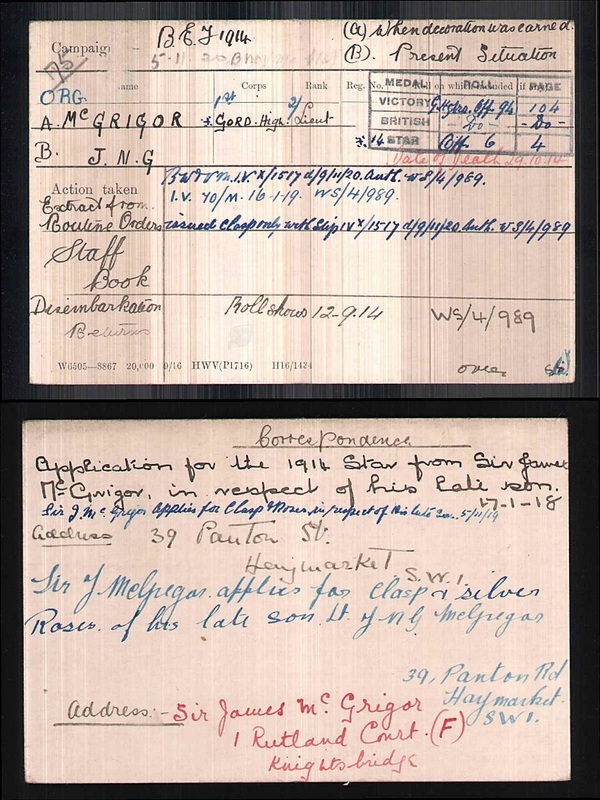 The 1st Gordons were assigned to 8 Brigade, 3rd Division. They were stationed at Plymouth in August 1914, mobilised for war later that month, and landed at Boulogne. Due to heavy losses after the Battle of Le Cateau, the 1st Battalion moved to Army Troops. At the end September, they returned to the 8th Brigade of the 3rd Division and were once again engaged in various actions on the Western Front. There is a post on the Great War Forum where a contributor has cited Cyril Fall’s Life of a Regiment, explaining that, on 12 October, the 1st Gordons were ordered to take the bridge over the Lawe river at Fosse. It took a considerable effort and the involvement of other battalions to take the bridge and continue the advance over the next couple of days. By 15 October the battalion was at the La Bassée-Estaires road. On 20 October, the 1st was sent to hold Grand Riez. The following day the 3rd Division, which made up the left wing of II Corps, was attacked by a strong enemy force. The Division was somewhat exposed by this counter attack and gave some ground along the La Basse Canal (east of Neuve Chapelle to Fauquissart), retiring to hastily prepared positions. There were German attacks again on the night of 23 October and on 24 October. It was while repelling one of these German attacks that Neil was wounded. The post from the Great War Forum explained: “The 1st Gordons were on the left of the 8th Brigade, about 400 yards from the 15th Sikhs of the Jullundur Brigade. The wire which was promised to help fill this gap did not appear. Determined German attacks broke through the right-hand Gordons Company and despite reinforcement from the reserve company, the Germans continued to press the right of the battalion back to the orchards of Fauquissart on the main Neuve-Chapelle to Armentieres Road. Two companies of the 4th Middlesex then arrived and a counter-attack was launched by this combined force which regained the positions from which they had been expelled.” The 1st Battalion Gordon Highlanders casualties for the period were: 7 officers (5 listed as missing); and 197 other ranks (163 listed as missing). Neil was shot through the lung and shoulder on 24 October 1914, near Fauquissart, Northern France. Both the Roll of Honour and Neil’s probate documents refer to 59 Cadogan Square, pictured left. This very large house was occupied by a widow, Mrs Halkett, 47, born in Gibraltar. It was close to the Lady Mountgarret Hospital for wounded officers, at 18 Cadogan Gardens, which opened in November 1914 and was affiliated to Queen Alexandra’s Military Hospital. Many people were offering rooms in their homes to be used as hospital rooms by a St John detachment; one guess might be that Mrs Halkett had done the same. Neil is also remembered in The Bond of Sacrifice, a biographical record of all officers who fell in the Great War.